Cuba, the largest Caribbean island is famous for many things: white beaches, rum and cigars, music and dancing, history and architecture and old American cars. Since my first brief visit in 2004, tourism in Cuba has boomed, especially in Varadero, Havana and Trinidad. Many people visit Cuba as part of all-inclusive packages to the Varadero beach resorts. A good proportion of those who do venture further afield, do so on organised tours. Whilst, of course, there’s nothing wrong with those travel styles, they’re not for Andy and I as we prefer independent travel. This led us to our recent discovery of how challenging and frustrating independent travel to Cuba can be. Our recent trip to Cuba was one of our most challenging travel experiences to date (and we’ve both travelled extensively), so we wanted to help those who prefer to ‘go it alone’ like us. Cuba’s not somewhere that’s easy to turn up and just wing it; you really need to do your research and a bit of planning first. 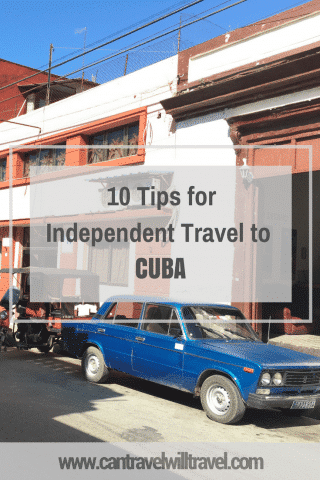 So based on our experiences and the main causes of our headaches during our time in Downtown Varadero, Santa Clara, Trinidad and Havana, here are our 10 tips for independent travel to Cuba. ATMs in Cuba charge a 25% fee to withdraw money. This means that for every £100 GBP ($139) withdrawn in Cuban Convertible Pesos (CUC) your bank account will be debited £125.50 ($173.75). This is on top of charges imposed by your own bank. For Americans, there’s the extra complication that ATMs don’t accept cards issued by American companies. 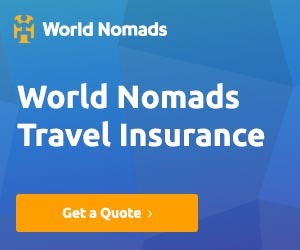 The best way around this is to take enough cash to last your trip. As Cuba’s far from being a cheap place to travel (and trust me, we tried to do it on a budget) take the amount you think you’ll need plus at least half again. You can always take it back home if you manage not to spend it all. For an idea of the budget you may need Flight of the Educator has shared her Cuba Budget for five days. Another thing to note is the 10% charge for exchanging US dollars (for the Americans amongst you 1 CUC is equivalent to $1). It’s best to take a different currency such as British Pound Sterling, Euros or Canadian Dollars to exchange when you arrive. To confuse matters further Cuba has a dual currency system. Alongside CUC is the local Cuban Peso or Moneda Nacionale (CUP) and although you can manage fine using just CUC, having a few CUP can be useful. It will enable you to buy a cheap bite to eat or a coffee from a hole in the wall fast food joint or fruit and veg shop, saving you a bit of money too in the process. Getting wifi access in Cuba is troublesome, to say the least. It’s controlled and restricted by the government and isn’t available for free anywhere. The only way to get wifi is using an ETESCA wifi card which can be bought for 1 or 1.50 CUC (£0.72 – £1.07) per hour. I think it should be a standardised 1 CUC, however, we were charged 1.50 CUC in a couple of the ETESCA offices, but this could be a scam so double check. The wifi cards can be used (or should I say ‘try to use’) in or outside an ETESCA office, wifi zone or the occasional high-end hotel. Wifi zones are easy to spot by the groups of locals in public areas on their mobiles, more often than not in parks (parques) or squares (plazas). It proved to be such a time-consuming, frustrating pain-in-the-arse that in the end, we gave up. We decided it wasn’t worth wasting our precious time and we went offline for the rest of our time in Cuba. This is why we suggest you prepare for having no wifi – to avoid the frustration, and wasted time and effort. Print out Travel Documents – you won’t be able to access accommodation or flight confirmations unless you screenshot them on your phone. I always keep mine safe in my money belt (although I rarely actually wear it). Pack a Guidebook – a guidebook, either a paperback or an e-book will be invaluable for ideas for accommodation, food, drink, sights and activities. Dad bought us a great Cuba Lonely Planet Guidebook for Christmas but it was a bit too heavy for our bags. Instead, we downloaded the Cuba Lonely Planet kindle version of it and a Cuba Rough Guide kindle version. Download a map app – it’s practically impossible to get hold of a paper map in Cuba and if you do find one it will be expensive. You can’t download offline maps without wifi so your best bet is to download a map app before leaving for Cuba that works offline. We usually use Google Maps, but, this doesn’t work in Cuba; instead, we ended up using the Maps.me app. This was a lifesaver when it came to finding ATMs, restaurants and directions offline! Beware that occasionally it can be slightly out of date although it worked most of the time for us and is enough to prevent you from getting (too) lost! Download books, films and music – if you like to have any of these for entertainment make sure you download them before leaving home. You won’t be able to download once you’re in Cuba even if you do buy a wifi card. My Kindle Fire got a lot of use in Cuba. If you prefer to book your accommodation before your trip you can book hotels in Cuba on Booking.com. 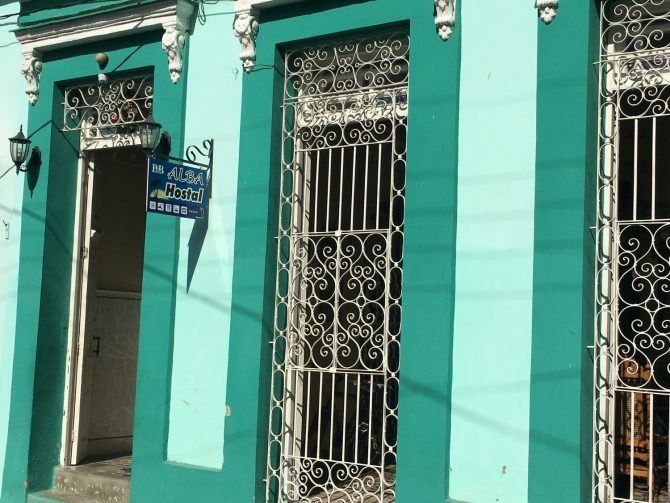 A better option in our opinion is to stay in casa particulares, these are rooms in a Cuban families homes or a private apartment that they own. Staying in these give a fantastic insight into real Cuban life. You’ll find most families warm and welcoming. Usually, the price includes some sort of breakfast ranging from a simple continental to huge feasts of eggs, bread, cake, and fruit. The one we had at our casa in Santa Clara was enough to keep us going all day! Many hosts also invite you to join them for meals if you wish (at an extra cost); if you do this it will likely be the best meal(s) you’ll have in Cuba. Nowadays, you can book some casa particulares via Airbnb and other similar websites. It’s a good idea to book your first couple of nights in advance before departing for Cuba. After that, especially if you like to be flexible you should be able to find a casa particular pretty much anywhere once you arrive. 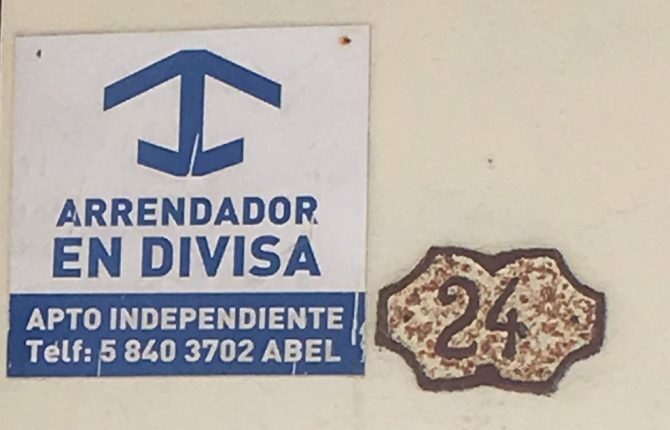 Just look out for houses with a ‘blue anchor’ on or near the front door which indicates that the casa is available for foreigners. A ‘red anchor’ indicates they’re only for Cuban guests – they tend to have lower standards and prices. We found the majority of food in Cuba to be very bland; in fact, blander than bland. It didn’t take long for us to become sick of dry meat and rice and ham and cheese. 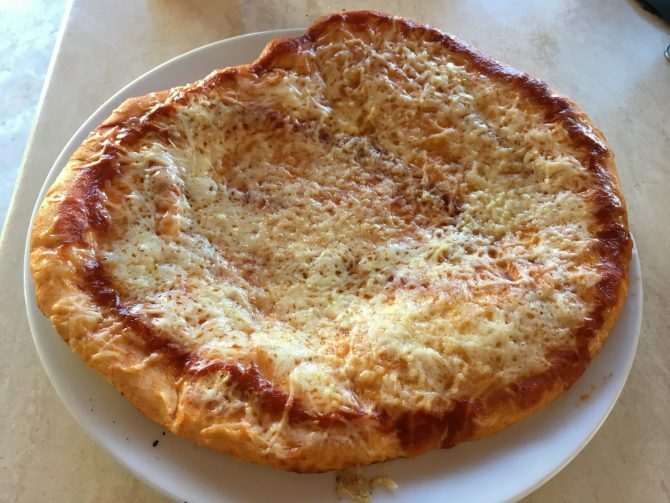 Ham and cheese rolls, ham and cheese pizza, ham and cheese pasta, ham and cheese with ham and cheese – you get the idea?! This is especially true if you’re on a budget; don’t expect many culinary delights unless you’re able to pay a premium at the more expensive restaurants or high-end hotels. Also, don’t be surprised to be told many items are off the menu in restaurants due to ingredient shortages. This happened to varying degrees nearly everywhere we ate. Buy budget food at the hole in the wall joints – these take CUPs instead of CUCs and although it gets repetitive quickly you can pick up a small pizza, spaghetti, or sandwich for between 0.40 – 1 CUC. Eat in paladars – despite finding the food in Cuba, as a whole, pretty dire, there were a few exceptions. Those tended to be in paladars – restaurants set up in local Cubans homes. We had two or three passable meals in paladars, still not amazing and rather pricey, but they made a welcome change to the usual bland fare. 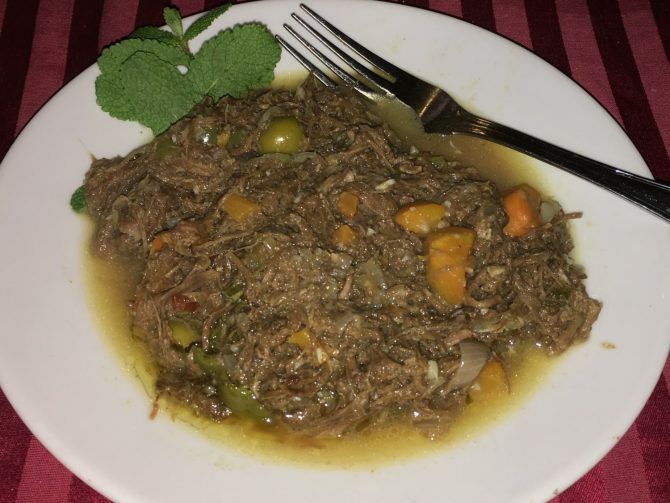 If you eat in a paladar try Ropa Vieja or ‘old clothes’ (shredded beef stewed in a tomato and vegetable sauce) and Lobster Pasta. These were the only two dishes that I thought were quite tasty. If funds hadn’t been an issue I’d have alternated these every night; at least until I got sick of them. Pack condiments and snacks – Apart from in Havana, there was a distinct lack of condiments in eateries. We did see ketchup, mayonnaise, and mustard in a few shops but they were expensive. A great addition to your baggage would be your favourite condiment(s) to liven up the dull food a bit. In Andy’s case, he wished he’d packed Tabasco sauce and Ketchup. Taking snacks like cereal bars and nuts is also a good idea to save a little cash and fill a gap when you’re sick of the other food on offer. Another thing you may consider taking (mainly for the English amongst you) is ‘proper’ teabags. It’s extremely difficult to get a decent cuppa in Cuba and nearly all the casas we stayed at had only coffee at breakfast. If you take tea bags, just ask for hot water, milk and sugar and you’ll be sorted. As you’d expect, drinking tap water in Cuba is a ‘no-no’ and bottled water is expensive, especially in touristy places. It was about $2 (£1.55) for a 1.5-litre bottle in Trinidad and elsewhere wasn’t much better. This soon adds up when you’re getting through two to three litres of water per person a day. Of course, you can boil water to kill off anything harmful; we tried this though and it produced a white residue which we didn’t fancy drinking even though it was probably safe. Note: Andy later discovered the residue was natural minerals occurring in the water (or to be more precise – limestone). This would have been fine to drink, but it tasted funny so we decided to put up with the cost of bottled water. In hindsight, the obvious solution to the water problem is to take a water filter with you. This will allow you to drink the tap water and avoid the cost and plastic waste of bottled water. We love the filter water bottles from Water-to-Go, we also have a special 15% discount code you can use – just enter CTWT15 at checkout to redeem. Although we wish we’d taken a water filter to Cuba we haven’t actually tried any yet so can’t make any specific recommendations so be sure to do your research before buying one. The main and cheapest form of public transport for getting around Cuba is by Viazul buses. These are government run buses which foreigners are meant to use. There are also one or two other bus companies that are beginning to offer limited services. There are, of course, also local buses which are cheaper and more flexible. which you may have some luck with depending on how good your Spanish is and how ‘un-foreign’ you look. For the most part though getting a Viazul bus is the main public transport option for foreigners. It is possible to book Viazul bus tickets online before departing for Cuba. If you don’t book online though, in order to guarantee yourself the bus and seat you want, you’ll need to go the bus station to reserve it as early as possible. The more popular the route the earlier you should think about reserving your seat(s). You then have to return to the station on the day of travel an hour or so before departure to pay and collect your ticket. It’s quite a pain and seemingly a waste of time but it’s the only way to be sure you get to where you want to be on time if travelling by bus. If you’re looking for an authentic Cuban experience you really need to get away from the tourist trail a bit. By tourist trail I mean those places that are hugely popular with tourists, especially tour groups. Varadero (Hotel Zone), Trinidad Old Town and Havana Vieja (Old Town) are prime examples. Of course, it’s still good to visit these places – they are popular for a reason after all as Layer Culture shares in a post about things to do in Havana. However, if you want a taste of ‘real Cuba’ head for one of the smaller or less visited destinations. As we only had a couple of weeks to explore we didn’t venture as far off the beaten track as we normally like to. We did manage to spend a few days in Santa Clara though and it was probably our favourite part of our Cuba travel. If you want to take electrical appliances to Cuba that are not compatible with 110V, you’ll need to take a 110V to 240V voltage converter. Some laptops and mobile devices are compatible with both voltages and should specify this on the power supply or charger. It’s items such as hairdryers, straighteners, electric razors and toothbrush chargers that are most likely to need a converter to function correctly. Make sure you double check the power rating of your products and converter before using them together though. Andy and I both purchased a BESTEK Travel Adapter Voltage Converter which charges all our gadgets really quickly and also doubles as an extension lead. They each came in a handy travel case with plenty of room to stow other items such as USB cables. The only downside is they’re a little heavy, but despite this, we found them invaluable during our time in Cuba and since then. We didn’t see one single laundry while we were in Cuba; maybe we weren’t looking in the right places but I doubt it. With this in mind, be prepared to do your own laundry. This will typically involve handwashing in the sink or shower so a good addition to your packing is some laundry soap. You can get this in liquid or powder form or you could take a laundry detergent bar like we did, which is great as it doesn’t spill in your bag. We didn’t see this for sale in Cuba so take some with you. To dry your clothes a length of paracord (at least 10-metres) doubled over and twisted makes a perfect washing line. During your time in Cuba, you’ll inevitably become increasingly agitated with the slow, usually poor service, and the queues. This is especially true for government establishments; we think (although we may be wrong) the reason was that the people working have very little reason to help you. They are paid a low set wage unrelated to performance with little risk of reprimand for poor service. Mostly they seem to do as little as possible with no urgency to provide timely and quality service. Potential customers are regularly ignored whilst staff play games on mobiles, chat amongst themselves or do anything except their job. This has the knock-on effect of queues, often very long queues which are really frustrating. It doesn’t help to get annoyed though; instead, just be prepared for it and be patient and tolerant. Remember that eventually you will reach the front of the queue and get served; if that is, they don’t close first. Yes, that did actually happen to us when waiting to exchange currency at a CADECA. When that happens you just have to try again later! On the flipside, you should receive better service from private casa particulares, paradars and hole-in-the-wall places run by locals trying to supplement their government incomes. We hope you’ll find these tips useful if you’re planning to travel independently in Cuba and that they help you make the most of your time there. 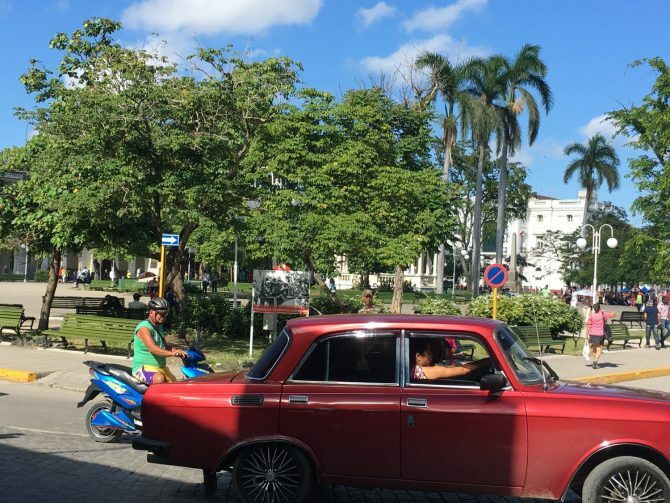 Retha from Roaming Nanny shares 5 things to expect when travelling to Cuba, which gives some additional insight into the country. We’re travelling as a couple but if you’re a solo female traveller, fellow travel blogger Claire from Claire’s Itchy Feet tells us what it’s like to travel in Cuba as a solo female. Have you travelled to Cuba independently? Do you have any other helpful tips to share that we’ve missed? We found that the food in the casa particulares was the best – we stayed in one where the owner was previously a chef for one of the top hotels in Varadero. I think we rolled out of that one. The food was amazing, as was sitting on their roof terrace eating it, overlooking a small bay that we’d swum in that morning. I’d love to visit Cuba – I just wish it wasn’t so complicated with visas and things. Thanks for sharing all these helpful tips! It’s incredible how expensive the atm charges are… good to be forwarned! Great tips! I can only not agree with point 4. I travelled Cuba independently last year and we only had amazing food. We just ate in our casa particular or in paladares and it was always super delicious! Great post! This is more or less my experience in Cuba as well. People should also note that there are random shortages in Cuba; at every other restaurant we went to there would be menu items that were unavailable because they didn’t have the ingredients. In one restaurant, half the menu was unavailable. It’s great for a digital detox! Plus they take 10 minutes off your wifi card every time you log in, so it ends up not being worth spending money on the spotty wifi. That all said, I would definitely go again if given the opportunity!